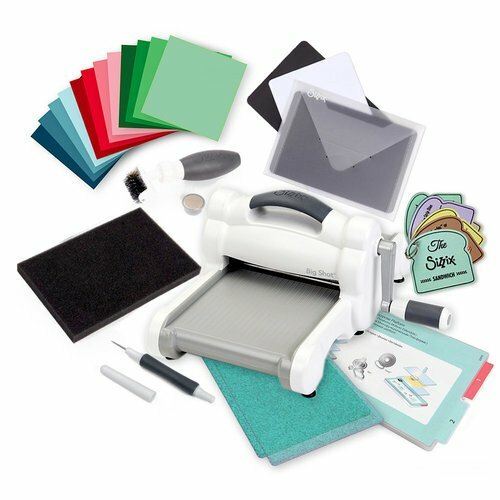 We've got style, power, versatility, and endless die-cutting possibilities with this amazing Sizzix Big Shot Machine and Accessories Bonus Bundle with Exclusive Scrapbook.com Sparkle Cutting Pads! The Big Shot Machine measures approximately 14" x 12" x 6"
The adjustable Multi-Purpose Platform measures 11.5" x 7" x 0.75"
Each Ocean Sparkle Cutting Pad measures 6.125” x 8.75 ” x 0.125"
Foam Pad measures 4.5" x 7.25"
The Die Brush measures approximately 5.5" x 1.75" x 1.25" with attachable Magnetic Pickup Tool measuring 1" x 0.5"
Three envelopes measure 5" x 6.875" and magnetic sheets measure 6.5" x 4.375"
If you've been looking to upgrade your card-making from paper and scissors to intricate, machine-cut designs, this is the bundle you've been waiting for! 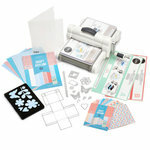 If your mini machine has been well loved and you're ready for the next step up in the die-cutting business, this set is for you! If you're the last of your crop circle who's not die-cutting for cards, layouts, pages, home decor, gift tags and more, then your wait is about to be over! The Sizzix Big Shot Machine is a beautiful, sleek, and stylish machine, sure to impress anyone who sees it proudly displayed in your craft room! 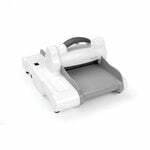 Designed with style and power in mind, this white and gray machine with a fancy embossed carrying handle has solid core steel rollers and solid steel gears. That means it doesn't just get the job done, but it also looks great while doing it! The Sizzix Big Shot is your ticket to one-of-a-kind and totally unique projects for yourself, your friends, your family, and your home! You can create cards, announcements, gift tags, treat boxes, goodie bags, gift card holders, invitations, scrapbook pages, banners, home decor, fashion accessories, magnets, ornaments, and many more fantastic projects with your die cuts! Let's talk about tools of the trade! 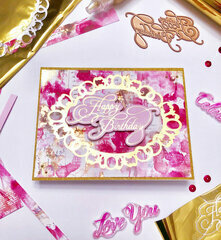 We've bundled your new best friends right into this set to make die-cutting as easy as possible! We've got a handy brush for cleanly removing your intricate die-cuts from the excess paper ensuring a crisp, clean cut every time. 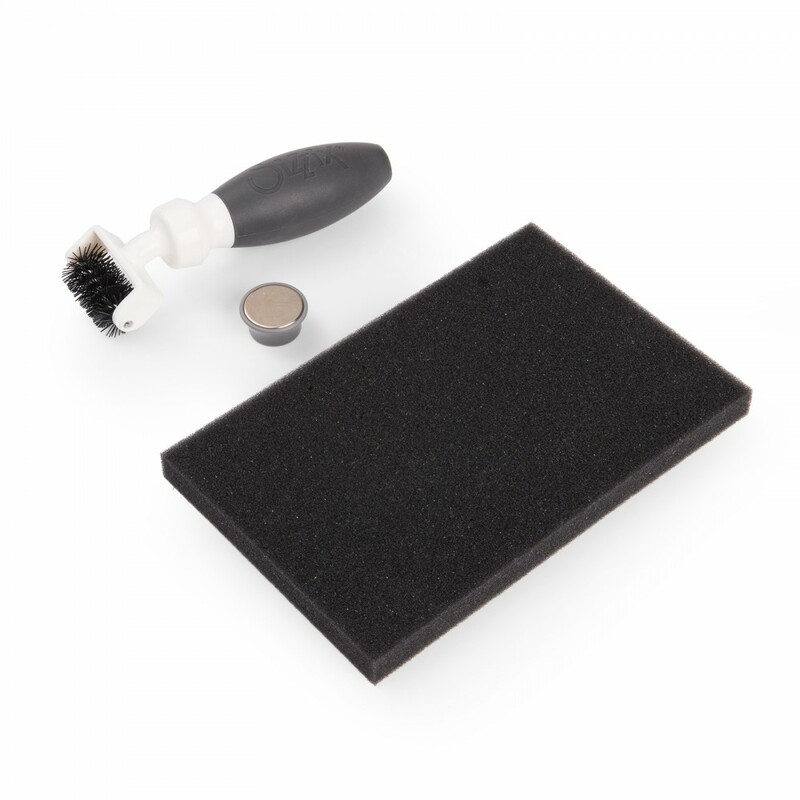 Also included is a magnetic pick-up tool that attaches to the bottom of your brush to find scattered dies on your workspace (so you don't accidentally toss out a tiny die with your scraps of cut up paper!). And there's a versatile die pick for extracting those tiny pieces that might be stuck within your cut-outs so you don't do any damage as you complete your artistic die-cut visions! The Sizzix Sandwich Booklet is 16 pages of helpful, guided instructions so you never feel like you're in the dark on how to use your die-cutting machine and find yourself wondering what goes where. It has easy-to-follow steps on how to properly prepare and load your dies, embossing folders, ShadowPress, Framelits, Thinlits, Movers and Shapers, and Triplits. No need to commit the order to memory with this handy-dandy (adorably-shaped!) sandwich guide! NOTE: Just in case you aren't totally sold on this amazing machine and bundle of goodies, you can compare the Sizzix Big Shot with other top-selling die cutting machines using our handy Die Cut Machine Comparison Chart. 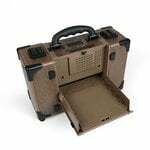 Instructions: To operate the Sizzix Big Shot machine with thin metal dies, use the included Sizzix Multi-Purpose Platform or an accessory platform such as the Sizzix Magnetic Platform (sold separately), as well as the included set of sparkly cutting pads. To create your die cutting “sandwich”, begin by placing the platform on the bottom. 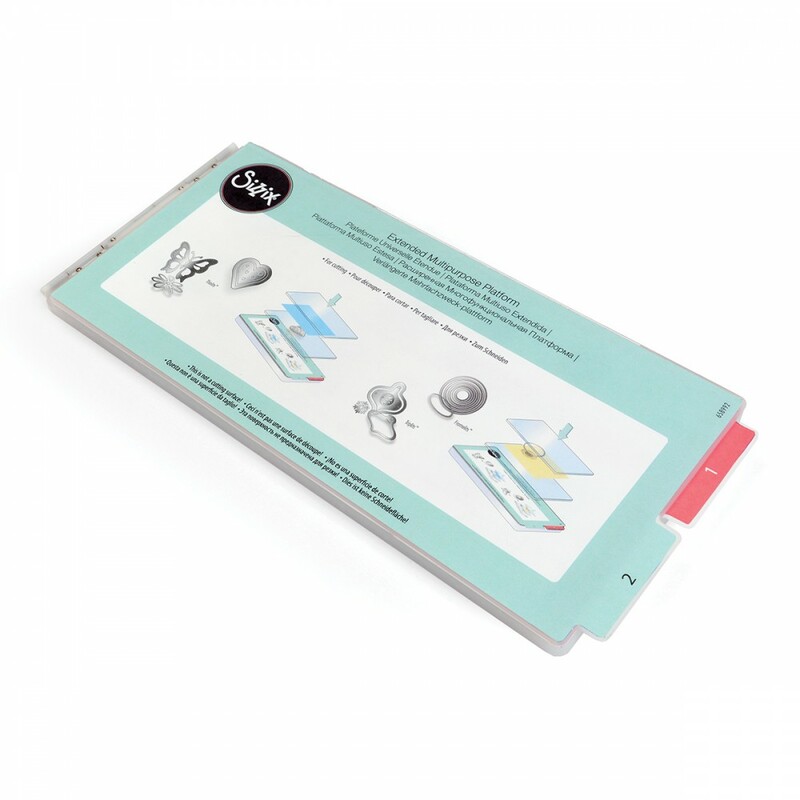 On top of the platform, place one Ocean Sparkle cutting pad. Then place your material right side up on top of the cutting pad. 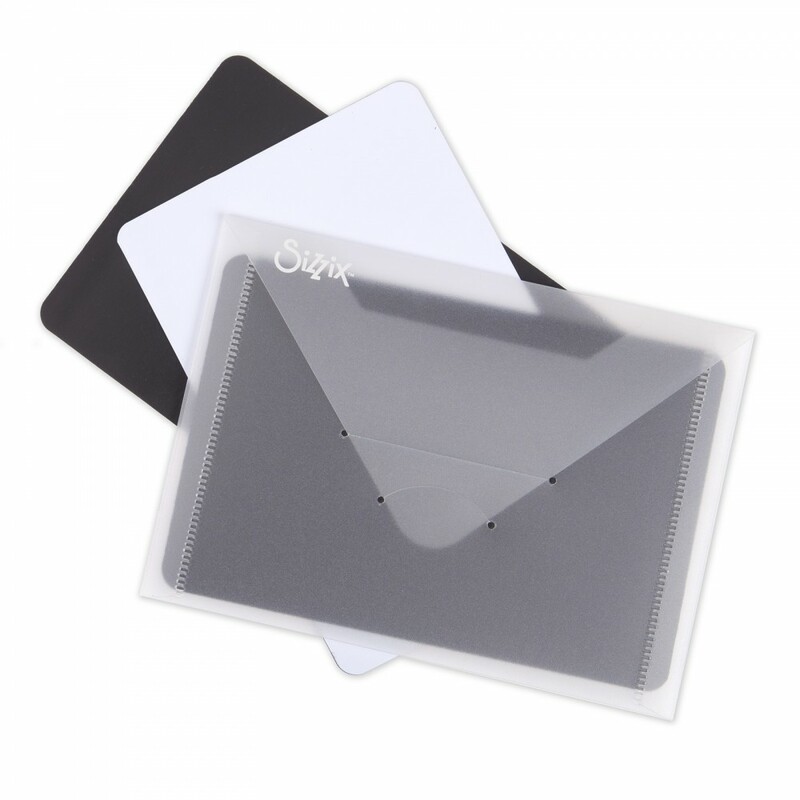 Place the thin metal die on top of the paper, with the cutting edge down (in contact with the material). Finish the die cut “sandwich” by placing the second cutting pad on top. Set the die and pad “sandwich” on the cutting path of the Big Shot machine, and turn the crank to move it through the machine. You may need a little bit more elbow power once the "meat" of your die-cut "sandwich" is rolling through the machine, but only a little more pressure will get you all the way through. To use the Sizzix Big Shot with a steel rule die, place the die between the Ocean Sparkle cutting pads with the material face down over the part of the die design you would like to cut. If needed, use Washi or masking tape to secure the paper in place to get perfect placement of your material. Set the die and pad “sandwich” on the cutting path of the Big Shot machine, and turn the crank to move it through the machine. 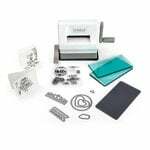 For easy reference of how to assemble “sandwiches” with the included Ocean Sparkle cutting pads for other types of dies and Sizzix accessories, use the Sizzix Sandwich Booklet that is included in this bundle! 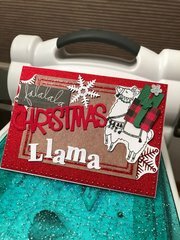 The possibilities are literally endless when you use your Sizzix Big Shot machine with thousands of thin metal dies, steel rule dies, and embossing folders that will bring projects you've only imagined in your dreams to life! TIP: The Ocean Sparkle plastic cutting pads often make loud creaking, cracking, and snapping noises while being cranked through the machine. This is no cause for alarm! This is a normal part of machine operation and the cutting pads and machine are designed to withstand the pressures of cutting. The pads may even show outlines of your dies after use - do not panic! This is totally normal as well! To extend the life of your cutting pads, flip them over periodically. This is a Scrapbook.com exclusive bundle. Big Shot - BIG DEAL! I bought the Big Shot a short time ago. Now I'm a crafter who has had a Cuddlebug and an Excalibur and I'm here to tell you that the Big Shot is the easiest machine to use...in my opinion. I love it! Scrapbook.com also had the best price and sale at the time I purchased this machine. I would recommend you check here before checking anyplace else before to buy. There is a reason more crafters use the Big Shot and I now know why!! Do you want to know why? I've been using another company's die cutting machine since I started card making 3-4 years ago. I've been ok with its performance, but could tell it was lacking, just from all the tutorial videos I watched with people using the Big Shot. I've only had this a week but can already tell it's miles above my old machine in quality, performance, and ease of use. I wish I'd have gotten this brand when I first started paper crafting! I highly recommend!! So far I am loving the whole die cut craft! It was very confusing at first what additional parts I need to make the “sandwich”. It seems there are a lot of add ons. I find that if I stick with products from one company, excluding the dies, then all the parts work. As for dies, I make sure I stay with “thinlits” or wafer thin die cuts. I've been wanting a Sizzix Big Shot for a long time, and I finally bought one. I'm estatic, oh all the projects I'm dreaming of. Now, to decide on which dies to buy and use. Wow, this is my first die cut machine and this is really the most amazing tool. I ended up getting this one because the reviews for the Big Shot were far and above some of the other brands. It is heavy but not so heavy that you can't easily pick it up and move it or take it with you to your craft group. It is very portable still even though it does not fold up. The pads are cute and hide the cut marks better than the clear ones. I used it quite a lot right off the bat. The pads are already pretty warped which I hear happens with all die cut machines so I am wondering how long they will last but so far no complaints,..this thing is really amazing!! This is sooooooooooooo nice. Can use bigger dies and it sure beats the slot machine type handle. It is wonderful that all the items you need to get started with is bundled into this set. Love my new Big Shot and the bundle that came with it. So much fun to use. Am more then pleased with the product and what all the bundle offer provided. 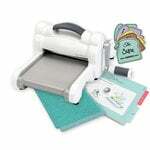 This machine can cut with Bigz Sizzix dies chipboard ? By: User (24-Jun-16) Helpful Question? Yes | No Thank you! Report Inappropriate This question has been reported. Thank you! Yes, it can cut chipboard with the Bigz dies. By: Sondia01 (26-Jun-16) Helpful Answer? Yes | No Thank you! Report Inappropriate This Answer has been reported. Thank you! Thank you very much for your help, I appreciate it .🙂 By: Nena Smith (03-Jul-16) Helpful Answer? Yes | No Thank you! Report Inappropriate This Answer has been reported. Thank you!